We have tried to provide everything that you could need for a comfortable holiday so that all you need to bring are towels, tea-towels and bed linen. If you don't want to bring your own bedding we can make up your beds using our own bed linen for an additional charge of £15 per double bed and £10 per single bed. We can also provide a towel pack at £8 per pack which includes a beach towel, a bath towel and a hand towel plus tea towel and bath mat for the caravan Please ask about this when booking the caravan. 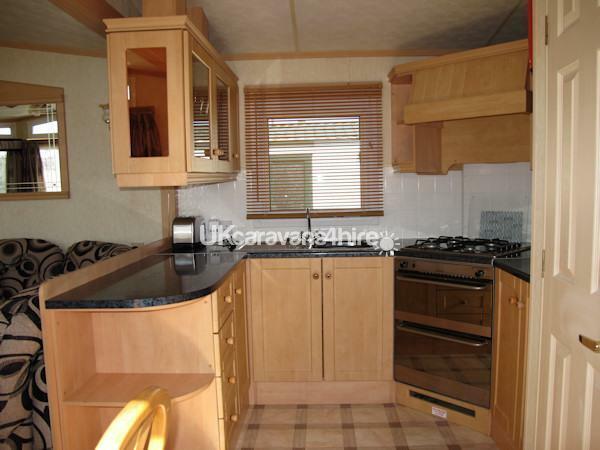 Luxurious 8 berth caravan located in a great position on the kingfisher site close to the childrens park. 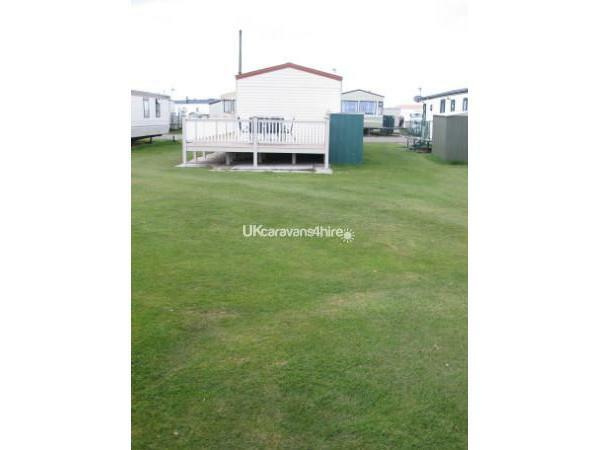 It has a fantastic veranda overlooking a large open grassy area at the rear of the caravan. 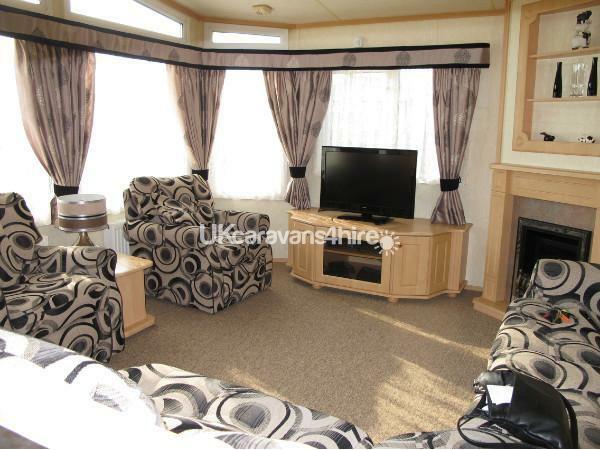 The caravan has central heating and is double glazed throughout guaranteeing a comfortable stay. 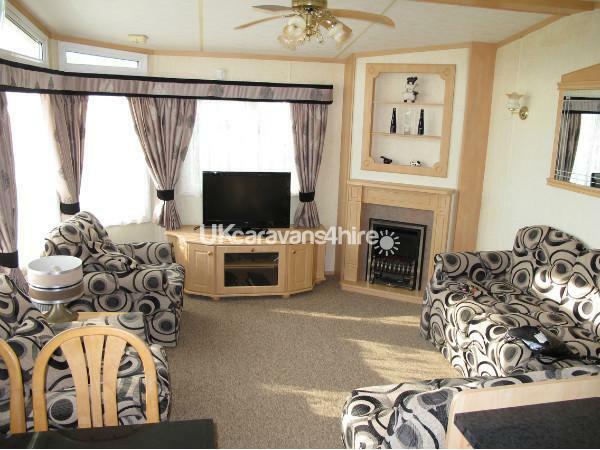 The comfortable lounge area has plenty of seating, with a long fitted sofa and two easy chairs. There is a huge 46” flat screen TV with free-view and built-in DVD player, plus a music system which plays CD’s or dock your ipod/mp3 player and listen to your own music. We also have a PS2 player with a selection of games for all ages. The living areas are open plan with a door between the living and bedroom area allowing the bedrooms to be kept quiet in the evening while the adults watch TV. Thre is a ceiling fan to keep you cool in Summer. 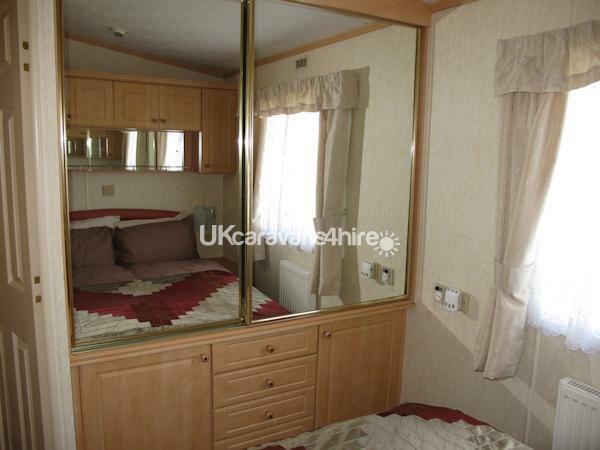 •Bedroom one has a double bed, triple mirror fronted wardrobe with drawers and cupboards below. There are two bedside tables and wall cupboards provide over-bed storage. •Bedroom three has two single beds which can be joined to make a double. It has a small wardrobe and over bed storage. 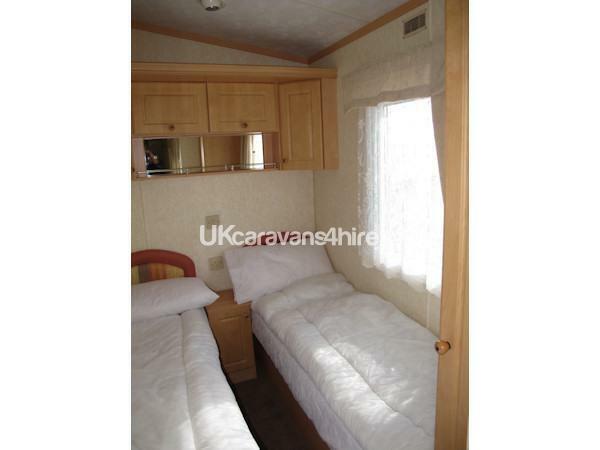 The caravan has separate bathroom and toilet. The bathroom has a double shower with folding glass shower screen. The under sink cupboard and shelves provide more than enough storage for toiletries. 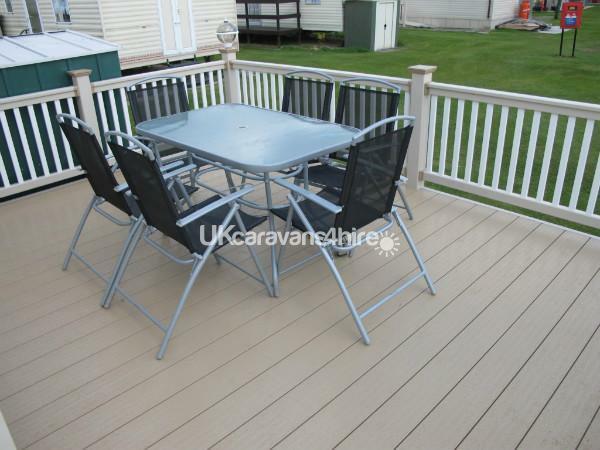 We have fitted a large veranda to the caravan. 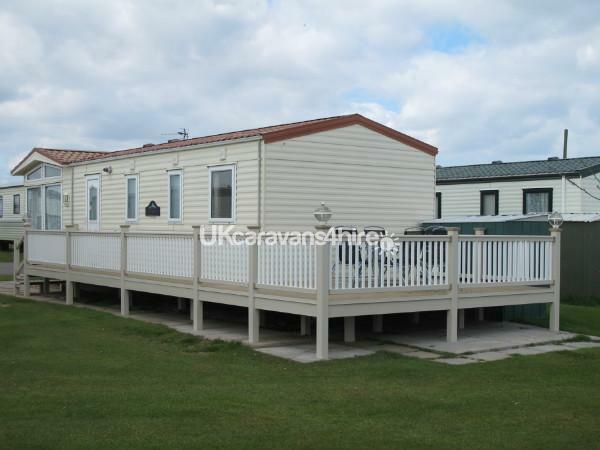 It extends down the side of the caravan to the back of the caravan and provides a fantastic 15ft x 10ft area overlooking the grass. The large secluded grassy area is great for the kids. There is plenty of room for games or even a paddling pool. Ideal for outside dining or for those days when you just want to chill out in the sun. At the side of the caravan is a storage box which is very useful for storing your bulky items such as suitcases, prams and beach essentials. There is also a BBQ which you are welcome to use. BJ’s entertainment centre, located by the site entrance, provides evening entertainment Including some fantastic tribute acts, a roller skating rink, cash bingo, large indoor play area for the children, amusement arcade and reasonably priced café -their ‘big breakfast’ meals are not to be missed. The sites sister park ‘Coastfields’ is a short walk away. Passes can be purchased which allow free access to the facilities which include another club with acts including a daily children pantomime, and indoor swimming pool with spa pool and toddlers pool. A £50 deposit plus £50 refundable security bond secures your booking with the balance payable six weeks prior to your holiday. 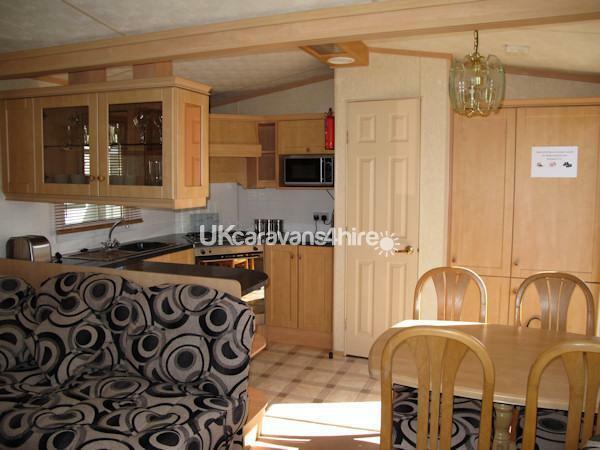 The security bond will be refunded, after your holiday, when the caravan has been vacated in a clean condition with no damage. We have tried to provide everything that you could need for a comfortable holiday so that all you need to bring are towels, tea-towels and bed linen. If you don't want to bring your own bedding we can make up your beds using our own bed linen for an additional charge of £15 per double bed and £10 per single bed. Please ask about this when booking the caravan.